Several years ago Andrew Parodi and Karen Olivo shared a part of their lives with the OMA through their donation of a collection of materials pertaining to the Colegio César Chávez. Last year, Andrew and Karen again shared their lives with the OMA, this time through an oral history interview. In the interview, Olivo and Parodi begin by chronicling Karen’s early life and her time spent living in Alaska. They continue by discussing how Karen met Arthur Olivo, her future husband, while attending De Anza Community College; Arthur’s work at Center for Employment Training in central California; and how Arthur and Karen began their relationship. The bulk of the interview begins when they explain Arthur’s decision to move to Oregon. During this part of the interview they detail their time working and living at Colegio César Chávez in Mount Angel, Oregon. They discuss the physical grounds of the college; the people they interacted with while they were there; events at the college; ethnic discrimination they endured; and the politics behind the closing of the college. Throughout the interview the two discuss aspects of Mexican culture and the family structure of the culture. They conclude by explaining the end of Arthur’s life and how having him in their life impacted them. Andrew Parodi (b.1975) was born in Mountain View, California. He is the son of Karen Olivo and the stepson of Arthur Olivo. 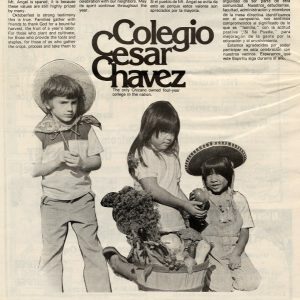 He lived at Colegio César Chávez with Karen and Arthur from 1980 – 1982. He attended Western Oregon University. Karen Olivo (b. 1939) is the widow of Colegio César Chávez student and groundskeeper, Arthur Olivo. Born in Chicago, at age 6 her family moved to Anchorage, Alaska to Yakutat where she lived with the Tlinget indigenous people. In 1977 while living in Sunnyvale, California and attending De Anza Community College, she met Arthur Olivo. Arthur was a teacher for the Center for Employment Training. When he was offered a job in Tigard, Oregon in 1979, Karen and her youngest son Andrew moved from Sunnyvale, California to Oregon with Arthur. In the Fall of 1980 Arthur enrolled at Colegio César Chávez and was also the college’s groundskeeper. Karen, Arthur and Andrew lived on the property of Colegio César Chávez until they were asked to vacate in 1982. Karen has lived in Gervais, Oregon, since 1983. She has volunteered for nearly a decade with the Foster Grandparents organization as a “Grandparent” at the Western Oregon University Day Care Center and the Jensen Arctic Museum. This entry was posted in OMA and tagged Colegio César Chávez, Latino/as, Oral History Interview. Bookmark the permalink.